The Best Easy Lemon Chicken Recipe – the absolute best quick and easy lemon chicken recipe with simple ingredients and TONS of lemon chicken flavor! Recipe can be made with chicken thighs or chicken breasts, and is naturally low carb and keto diet compliant. 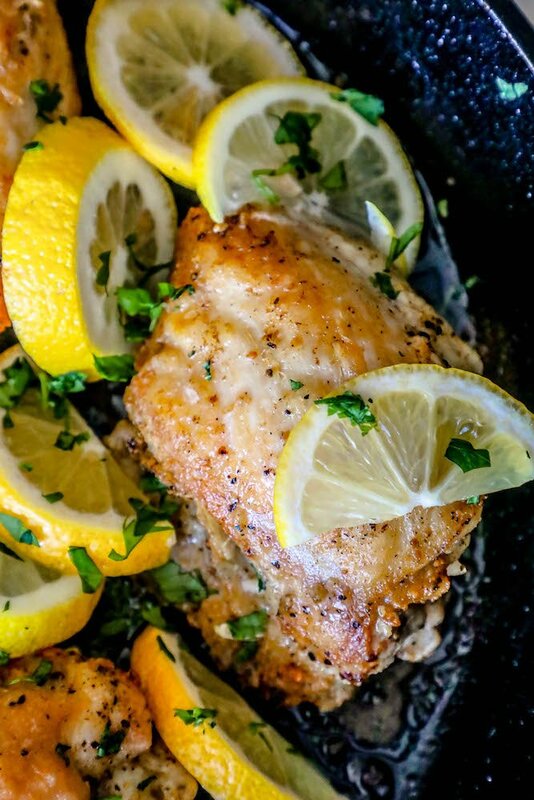 The best easy lemon chicken recipe is a simple, quick, and effortless way to get delicious restaurant-quality lemon chicken at home for a one pot chicken dinner the whole family will love. 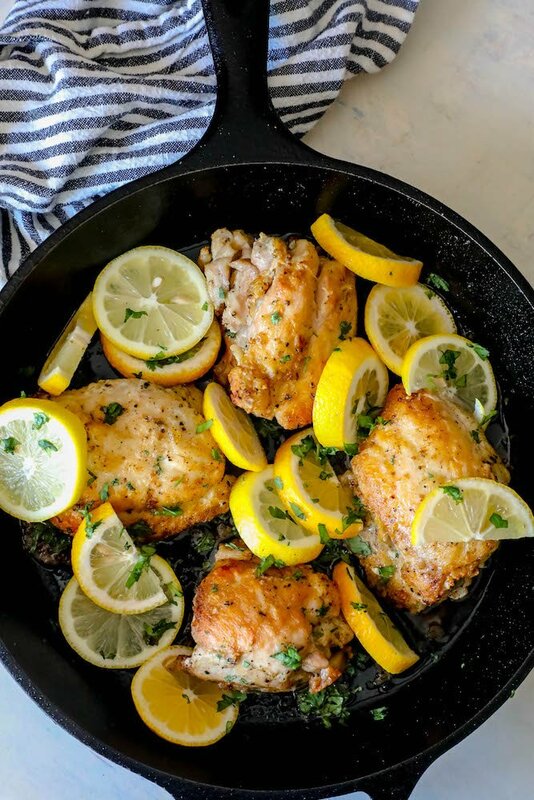 This easy one pot lemon chicken recipe is a great easy chicken dinner that is easy enough for a weeknight but decadent enough for a dinner party or sunday supper. 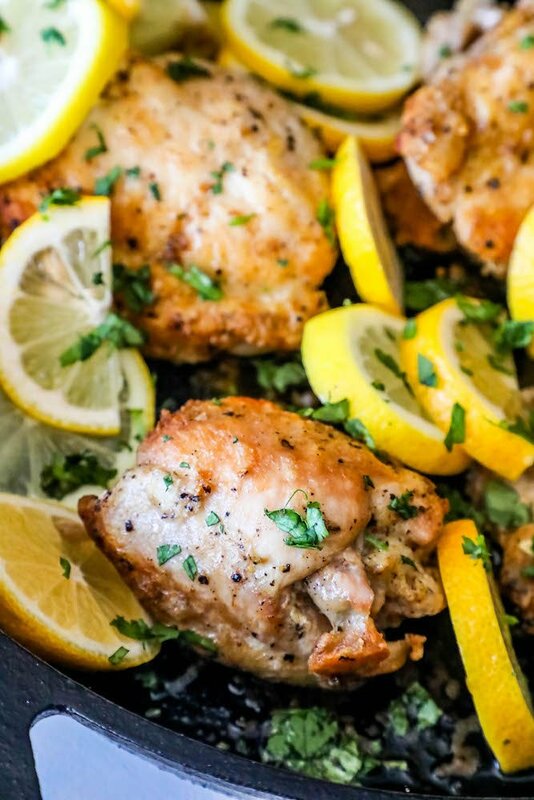 This lemon chicken recipe is keto diet compliant, making it a delicious low carb chicken dinner to add to your weekly menu rotation. 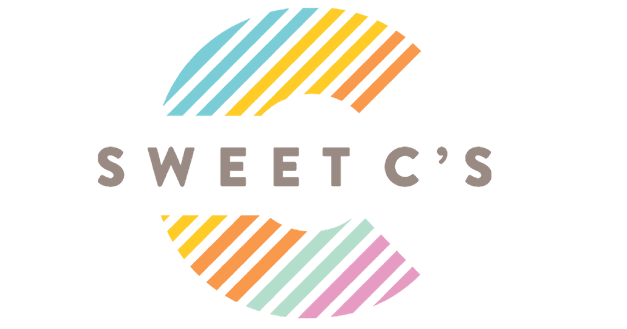 It’s great on its own, fresh from the skillet, or in sandwiches, salads, wraps, and in pasta or rice dishes! 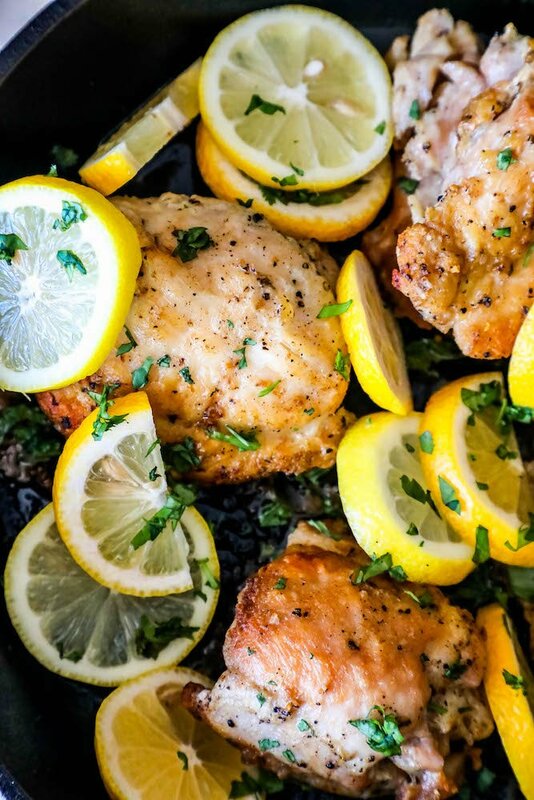 With this quick and easy lemon chicken recipe, you can use either chicken thighs or chicken breasts – whatever you prefer! I have formulated this recipe to be simple and delicious with either chicken thighs or breasts, so you can have a deliciously easy chicken dinner that fits your menu the best. Just Take Me to The Best Easy Lemon Chicken Recipe already! 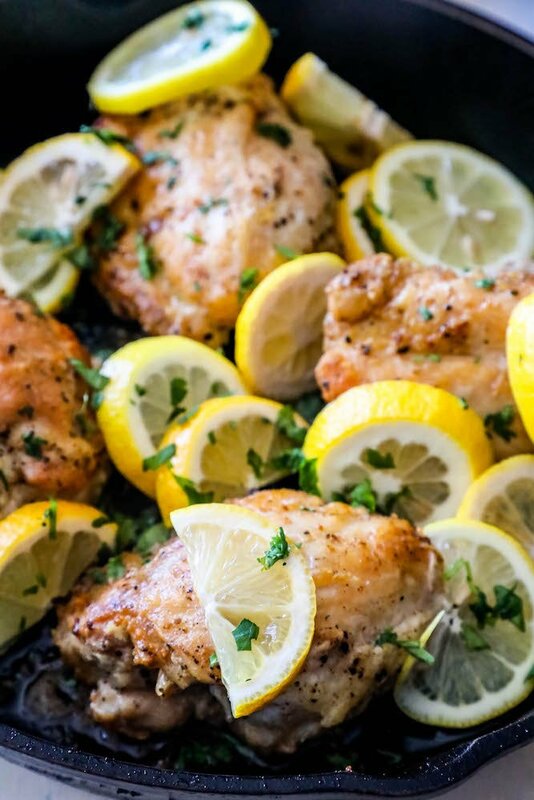 If you’d like to skip my helpful tips and tricks to make the best quick and easy lemon chicken recipe, please scroll to the bottom of the page to find the printable recipe card. If you’re using chicken thighs in the best easy lemon chicken recipe, I am giving my best tips for easy crispy pan seared chicken thighs (skin-on or skin-off). To get a perfect crispy crunch on chicken thighs, cooking them hot and fast is key. Don’t overcrowd your pan – it will bring down the temperature of the pan, making chicken flabby and not crispy. Cook in batches if needed to give chicken thighs ample room to crisp. Don’t overflip chicken, let thighs crisp up before flipping or adding to oven to bake. When pan frying, chicken thighs do best when they have been patted down with a paper towel to remove any excess water or fluid from chicken. 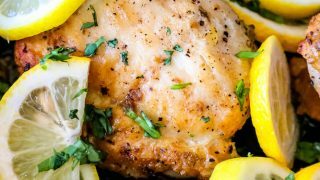 If you’re using chicken breasts in this quick and easy lemon chicken recipe, I am giving my best tips for easy juicy pan seared chicken breasts. -Marinate at least 4 hours. While this recipe will still taste great without marinating, it is the best when chicken breasts have marinated at least 4 hours and up to one day before cooking. Marinating helps infuse tons of flavor into chicken breasts, and helps to soften meat and make it more tender and easier to chew and cut. -Cut large chicken breasts down. Grocery store chicken, especially chicken breasts in economic bulk flat packaging (my personal favorite pick to help our family stay in-budget), can be very large. Extra large chicken breasts require more cooking time – so cutting down the chicken helps to make the chicken cook faster, without compromising the chicken’s tenderness. Depending on the size of your chicken, slice the breast in half length wise to make two smaller chicken breasts – or if the chicken is very fat, you can “butterfly” the breasts to make two thinner breasts. Pre-sear chicken breasts in a pan before baking for the best flavor and a little crunch on the outside! Like meat, chicken needs to rest at least 5 minutes after cooking before you want to cut into it so the juices lock in. 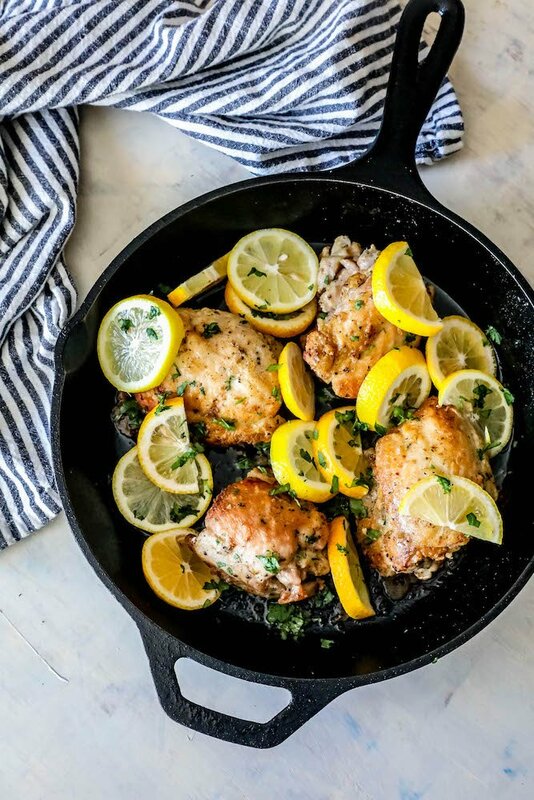 This easy one pot lemon chicken is one of my favorite one pot keto chicken dinners because it doesn’t require a ton of fancy ingredients or equipment. In fact, you probably already have most of this recipe on hand! If you love the best easy lemon chicken recipe as much as I do, please give it five stars and help me share on facebook and pinterest! To check out my amazingly delicious Air Fried Lemon Chicken Recipe please click here. In a large, heavy pan, heat olive oil until light and shimmery. Remove chicken from marinade, shake off excess liquid. Discard oil and marinade bag. Add chicken to pan and cook 3-4 minutes until one side is golden brown and crunchy. Flip and repeat for other side. When chicken is well seared on each side, check internal temperature. Place oven-safe skillet into oven and roast until chicken is 165 degrees internal temperature, about 5-10 minutes depending on chicken breast/thigh size. Remove from pan and plate with grilled vegetables, topping with sauce. Also great to add to salads, wraps, tacos, or save for meal prep to reheat for lunch. Loving all of your tips and tricks to getting this right! This is one of our favorite meals. YUM!! This sounds incredibly delicious!! Can’t wait to try it!! 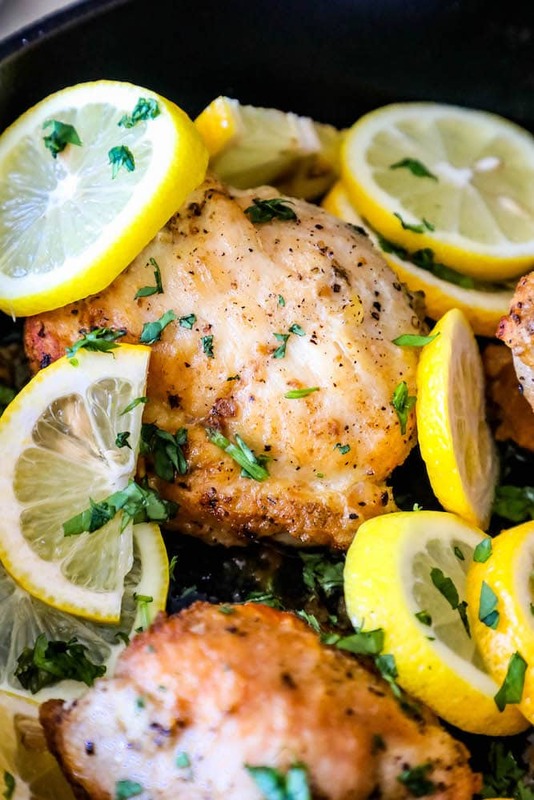 This recipe is killer, I love a good pan seared chicken, and lemon everything,. Yum! Absolutely mouthwatering and I love how easy it is! This looks so good! Thank you for sharing! !